Syncthing is a cross-platform peer-to-peer file synchronization client/server application written in Go, similar to BitTorrent Sync. It can be used to synchronize files between computers however, unlike BitTorrent Sync, Syncthing is open source. For more information about Syncthing, see our previous article: Syncthing: Open Source BitTorrent Sync Alternative (P2P Sync Tool). There are also some extra features provided by Syncthing GTK, such as running the Syncthing daemon in the background, option to display Node ID and QR code not only for local, but for remote nodes as well, or half-automatic setup for new nodes and repositories, which should work as a work-around for the "remote node shares repo with local node, but local node doesn't share it back" error. Update October 8, 2014: Syncthing GTK now supports filesystem watching and instant synchronization using inotify. Update October 13, 2014: Syncthing GTK now ships with yet another new feature: desktop notifications for file updates and Syncthing errors. Update December 2, 2014: quite a few new features were added: an option to update the Syncthing daemon automatically, first run wizard, stop/resume sync, speed throttling and HTTPS support on Linux. 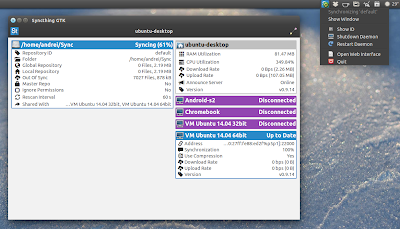 Update February 3, 2015: Syncthing GTK now ships with file manager integration for Nautilus, Nemo and Caja. Or, if you don't want to add the PPA, grab the Syncthing GTK deb from HERE. Arch Linux users can install Syncthing GTK via AUR. 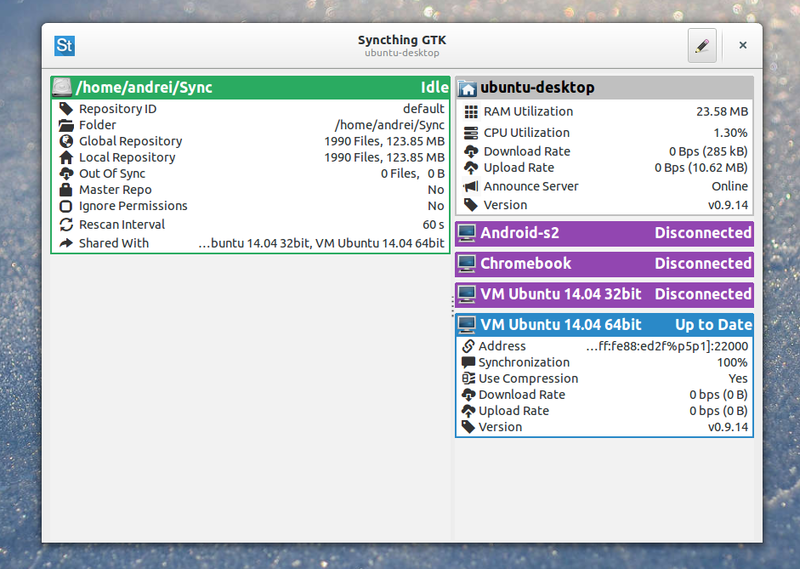 For other Linux distributions, grab the Syncthing GTK source from HERE.